On January 31, Wyoming County Commissioner Tom Henry (left) was approved as the new board chair for meetings in 2014, replacing Judy Mead (center), who was the county’s first female chair. In their final meeting of 2013, the commissioners, including Ron Williams (right), made several important announcements and confirmed that Wyoming County is ending the year on solid footing and is poised for continued growth and fiscal stability in 2014. 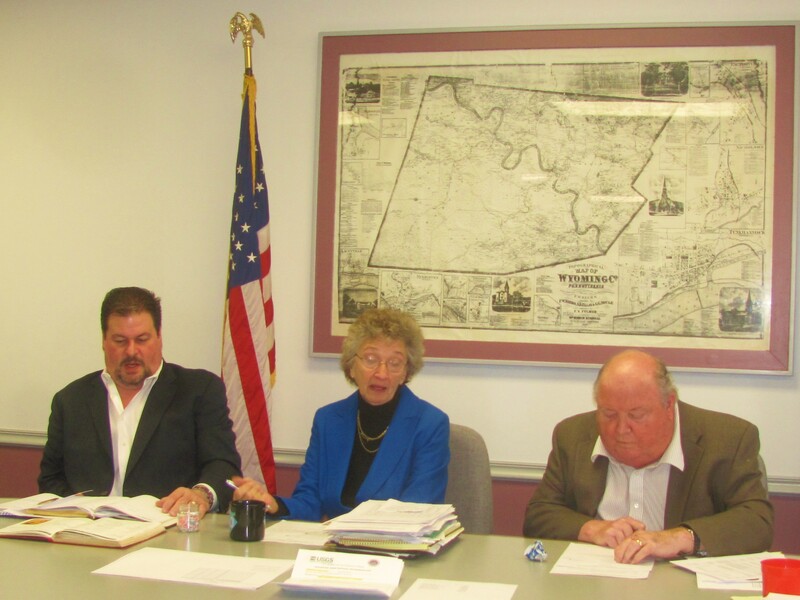 Following up on the upbeat tone expressed at their last meeting, the Wyoming County Commissioners approved a new budget that will require no tax increases and voted unanimously to abolish the longstanding five dollar per capita tax. “We’re in pretty good shape, so we can get rid of it,” Commissioner Ron Williams said assuredly. Chief Clerk Bill Gaylord noted that the county’s annual Tax Anticipation Note will be finalized on Friday, Jan. 2. The reduction of the interest rate on the loan routinely procured by municipalities to get them over the revenue slump of the first three months of the year to .97 percent will save the county approximately $14,000. That was just one element cited during the meeting that will help keep the county’s budget projections for 2014 in check at $13,499,443, which represents a 2.8 percent increase over 2013. Mead credited county employees for their frugal uses of available funds and for their progressive implementation of new programs and software that have increased the efficiency of county government. “I’m very proud of all of the employees who have worked so hard to keep it that way,” Mead stated. The commissioners renewed their contract with Public Defender Deborah Albert-Heise, who was in attendance, citing foremost her dedication to the office. Albert-Heise’s contract had come under scrutiny when the proposed budget was released last month, as it appeared to some that her salary had been more than doubled. Without being specific, Henry chided “the press” for printing erroneous information about thye contract. In fact, he was citing a letter to the editor by a non-county resident which was published in the Wyoming County Examiner that wrongly suggested that the commissioners had given the public defender an enormous raise. “That was pretty stinky,” Henry said to the newspaper’s editor, who was in attendance. The commissioners signed the contract, followed by Albert-Heise, who thanked the board for their vote of confidence and the approval to continue her duties with the county. The hiring of several new employees was approved, including Margaret Cadden as a probation officer, Deborah Camp as an administrative assistant in the sheriff’s office, and Carol Bardzel as deputy treasurer. Bardzel will replace Helen Montanye and will work with newly elected county treasurer Patty Mead. Gaylord related that it has been years since there has been such a changeover in the county treasurer’s office but expressed confidence that the transition will go smoothly. All newly elected county officials will be sworn in at 9 a.m. on Monday, Jan. 6, at the Wyoming County Courthouse in Tunkhannock. In other business, the commissioners detailed the disbursement of $53,550 in room tax grants, tightened up the rules for use of county vehicles, and approved the naming of a small stream in upper Wyoming County that flows into Mead Brook and Lake Carey. The final official act of the year was the stepping down of Judy Mead from her position as board chair and her nomination of Henry to replace her. The move was unanimously approved. “It has been an honor serving as the county’s first female chairperson,” Mead remarked. “I hope I can do half as good a job as she has,” said Henry after his appointment.